Viktor Horsting and Rolf Snoeren titled this collection Fashion Statements. “To what extent can you say something with clothing, literally,” they said backstage. Their studio had imagined 18 outstanding, outsize dresses constructed entirely in brightly hued tulle: some with puffed sleeves, others with tiered skirts, all very colorful and very voluminous. And, well, each creation spoke for itself. Who were these ingenues with their Rapunzel hair meant to embody? I am my own muse, said the one in solid green. Is fashion overrated? Less is more, replied the extra-wide one in gradient pink and blue. What is your position on climate change? Give a damn, declared the one in white trimmed in white and fluorescent green. Will you watch the Super Bowl? No, exclaimed the one in striped blue. Naturally, with their characteristic monotone, the designers said they were not imposing any meaning, inviting us to arrive at our own readings. One impression was that such exaggerated volumes, while familiar territory for Horsting and Snoeren, could be a visual metaphor for the noise of likes in the virtual world, where these language memes live (Snoeren seemed pleased with this idea). What’s more, there was no mistaking these creations for actual slogan T-shirts or variations on the infamous Melania Trump jacket. 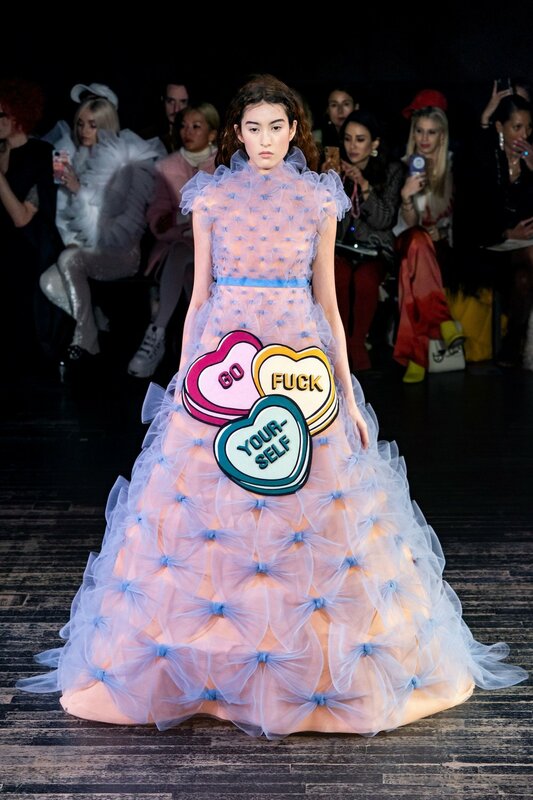 All the assorted typography and graphic design—the text as well as the eagle head, the skull, the candy hearts, and so forth—resulted from layers of additional tulle. Trite sentiments backed up by technical prowess. Altogether, the collection showcased Viktor & Rolf in the brand’s finest, sweet-meets-sinister form. As a fashion statement, it was ironic in attitude; historically inspired and Pop in presentation; detail obsessed and sophisticated in execution. The perfect formula, in other words, for the Costume Institute’s forthcoming exhibition on camp. Otherwise, several pieces could prove quite impactful on the red carpet, unwieldy shapes notwithstanding. The obvious choice: No photos, please.